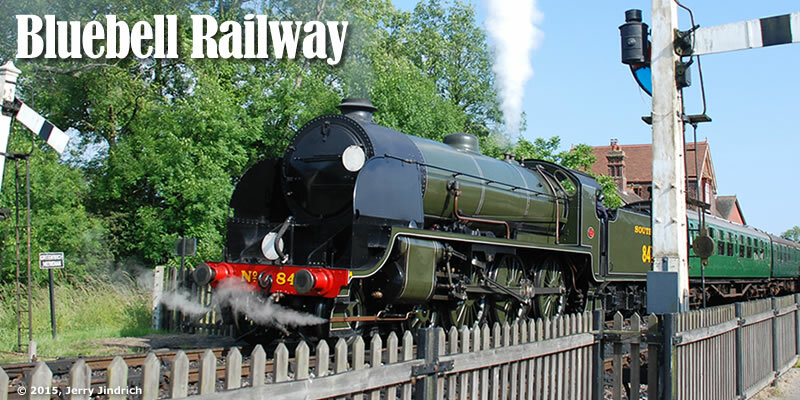 The Bluebell Railway began operations in 1960, when steam engines were still widely used throughout the United Kingdom. Bluebell organizers collected a variety of engines in good running condition as well as a number of historic locomotives (some over 100 years old). This was just before the British government "modernized" the nation's rail system and ended the use of steam locomotives, sending thousands of really useful engines to scrap yards. The Blubell founders not only saved engines, they wisely set up shops to maintain and restore engines and railway cars. They can even build completely new locomotives, coaches, and wagons. The Bluebell Railway runs from Sheffield Park (about 40 miles south of London) to East Grinstead, with stops at Horsted Keynes and Kingscote. The line was first operated by the London Brighton and South Coast Company in 1882. Many traces of the original railway remain today and Bluebell makes the most of its heritage. Each of its stations reflects a different era in the line's history through artifacts and decoration as you will see in the photographs. The Sheffield Park station was built in 1882 and was recently restored to an 1880s Brighton era style. A nearby engine shed contains historic enigines including Fenchurch (built in 1872). Engine 847 runs around to the head of a northbound train. This is the engine pictured at the top of this page. It was built in 1936. Bluebell (from 1910) parks alongside the next train at Sheffield Park. The Horsted Keynes station was also built in 1882. Visitors to the adjoining Carriage and Wagon Department can watch skilled craftsmen restore and replicate vintage railway equipment. Period detail at Horsted Keynes is from the 1930s and represents the Southern Railway era. The bookstall and stacked luggage (below) made it easy to imagine we had stepped back in time. Happy photographers capture the arrival of a train pulled by engine 592, a beautiful locomotive built in 1902. All of Bluebell's rolling stock was clean and gleaming, which added to the festive atmosphere. The Kingscote station (right) was built in the 1920s and represents the 1950s British Railways style. Visiting the Bluebell Railway was a treat. The locomotives and their trains were beautiful and in excellent shape despite their age. The rides up and down the line were fun. The railway's dedication to preservation and its ability to build new carriages and locomotives were fascinating. The Bluebell is an outstanding railway. Back to Fun With Trains Main Page. © 2015, Jerry Jindrich. All rights reserved. Revised 1/24/2016.